Robert L. “Bob” Wangsgard passed away at home in Ogden, Utah, on Friday, November 2, 2018, just seven weeks short of his 103rd birthday. Born in Brigham City on December 22, 1915, to Louis and Ione Maughan Wangsgard, he grew up in Huntsville in a family of teachers and farmers and, though a successful businessman and civic leader, never quite got farming or his love of Ogden Valley out of his system. He graduated from Weber College in 1936 and from the Utah State Agricultural College (now USU) in 1938, with a major in business. Originally planning to seek employment, he changed his thinking when he was offered a scholarship to the Harvard University Graduate School of Business. He graduated with an MBA in 1940 and began his professional career as an accountant at Lybrand Ross Bros. and Montgomery in Boston. Bob met Patricia Wallace, of Rock Springs, Wyoming, in Logan in the fall of 1937. They married in the Salt Lake LDS Temple in September 1939, and had been married 73 good years when Patricia passed away in September 23, 2012. 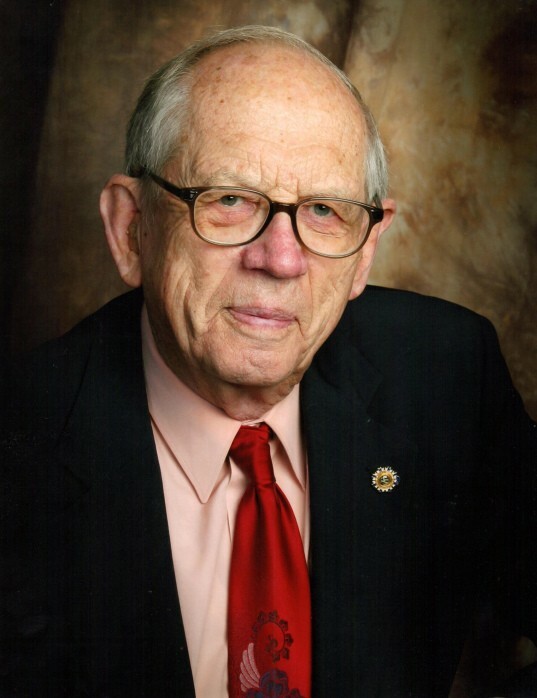 In 1941 they returned to Ogden, where Bob served first as Clerk of the Weber County School District and later worked in accounting at W. C. Parke and Sons. In 1943, with Patricia, he established a part-time accounting and income tax practice in their home, which became a full-time operation in the Eccles Building in 1946. In 1948, one of his clients, Stimson’s Markets, asked him to become the company’s general manager, and he eventually assumed the presidency and full ownership. Bob’s innovative ideas in the 1950s and 1960s—including drive-up windows—successfully transformed the marketing of food and self-service gasoline in the grocery business in the Ogden area. He retired from Stimson’s Inc. in 2004, at the age of 88. Bob served for 34 years on the Board of Directors of Associated Food Stores, 1952 to 1986 and was Chairman of the Board, 1984 to 1986. He also founded, directed and chaired the board of Merchant’s Inc., a financing subsidiary of Associated Food Stores, 1958 to 1976. Curious about all things, Bob enjoyed rock-hounding and lapidary work, extensive travel in the US and abroad, and in his later years, a beautiful garden. In 1957 he purchased 2,000 acres of rangeland above Huntsville from his father and an uncle and set about improving it by eradicating sagebrush, developing water sources, and planting productive grasses. The cattle he ran there gave him a good excuse to be out on a tractor or a horse in the country where he had herded sheep as a youngster. When the state of Utah took some of his rangeland to build Trapper’s Loop, he was sensible enough to challenge their financial offer and generous enough to show the engineers where to put it. Robert and Patricia endowed scholarships in business education at both Weber State and Utah State and funded a community room at the Weber County Library in Huntsville. He wrote a wonderful account of his life, which was excerpted by the Ogden Valley News in 2016 and widely enjoyed. Robert loved his wife and children and his children’s spouses, children, and grandchildren. He is survived by his son, Kent Wangsgard (Carole) of Ogden and daughters, Lynne Sadler (Richard) of Dundee, OR; Jo Crane (Al) of Soldotna, AK and Gold Canyon, AZ, and Ruth Nielsen (Art) of Layton; as well as eight grandchildren, and numerous great-grandchildren. His sister, Karma Wangsgard Smith, the youngest of five siblings, also survives him. The family expresses deep gratitude to Dad’s caregivers and companions over the last four years, including Lydia Quirarte, who was with him when he passed, Kathleen Pope, Maggie Lindley, and Alishia Williams. Funeral services will be held on Monday, November 12, 2018 at 11 a. m. at Lindquist’s Ogden Mortuary, 3408 Washington Blvd. Friends may visit with family on Monday from 9:30 to 10:30 a.m. at the mortuary. Interment, Lindquist’s Washington Heights Memorial Park, 4500 Washington Blvd. In lieu of flowers, please consider a contribution to YCC Family Crisis Center, Ogden.